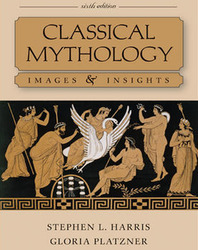 Classical Mythology: Images and Insights approaches the study of myths through complete works of Greco-Roman literature, including six complete Greek dramas and generous excerpts from the narratives of Homer, Hesiod, Virgil, and Ovid, and through carefully chosen examples of classical works of art, both painting and sculpture. Combining literary masterpieces with the visual arts, this integrative approach offers readers a comprehensive experience with both cognitive and aesthetic appeal. Chapter 1: Introduction to Greek Myth includes more attention to the importance of the feminine divine principle and the role of female priests. Chapter 6: The Olympian Family of Zeus: Sharing Rule of the Universe includes an expanded discussion of Hera to emphasize the Queen of Heaven's prehistoric importance as a goddess who was once worshiped independently of the Olympian patriarchy. In Chapter 7: In Touch with the Gods: Apollo's Oracle at Delphi, the presentation of Apollo has been significantly revised to show both his connection to earlier goddess figures and his evolution as a god of prophecy and as the enlightened initiator of young men into civic responsibility. Chapter 14: Myth and the Tragic Vision in the Theatre of Dionysus: Euripides' Bacchae now includes the complete version of Bacchae to position the only extant tragedy to feature the wine god in a leading role clearly in the context of Dionysian ritual and Athenian drama. Chapter 18: The Roman Vision: Greek Myths and Roman Realities includes an expanded discussion of Roman rituals, religion, and heroes. Chapter 21: The Persistence of Myth has been updated to give readers more accessible descriptions of recent European and American works and brings the uses of myth up to the most recent (2010). Presents myths in the general chronological order in which the literary works containing them were written, allowing readers to perceive the ways in which myths changed and developed over time, from the orally composed epics of Homer in the eighth century B.C., through the poetic hymns praising individual Olympian gods, such as Demeter, Apollo, Dionysus, and Hermes, to the much later Athenian plays dramatizing the myths of tragic heroes and heroines of the fifth century B. C., to the still-later evolution of myth in the environment of imperial Rome, and myth's further development in modern American and European literature and art. Facilitates Student Learning with chapter-opening “Key Topics/Themes” section, marking all major names and concepts in boldface, a pronunciation guide, “Questions for Discussion and Review” at the end of each chapter, and numerous boxes and sidebars throughout to give additional helpful information on a particular god, heroine, or important mythic theme. Invites readers to learn the myths via the same approach as people did in antiquity, by studying through superb works of art and literature. The book includes complete Greek plays and extended excerpts from the narratives of Homer, Hesiod, the “Homeric Hymns,” Virgil, and Ovid. Includes over 200 works of art and a collection of lavish color plates that enhance the narrative and bring the texts to life. Prefaces each literary work with a thoughtful essay explaining the significance of individual myths, as well as the many different ways that particular writers reinterpreted the myths, emphasizing their evolutionary dynamism. This combination of original material and lucid analysis effectively equips students to grasp a myth’s multivalent purposes and meanings. Stephen L. Harris is Professor Emeritus of Humanities and Religious Studies at California State University, Sacramento, where he served ten years as department chair. A Woodrow Wilson Fellow, he received his M.A. and Ph.D. from Cornell University. A member of the Society of Biblical Literature, his publications include Understanding the Bible (8th edition, 2011); The Old Testament: An Introduction to the Hebrew Bible (with Robert Platzner); Classical Mythology: Images and Insights (with Gloria Platzner); Exploring the Bible; and Fire Mountains of the West: The Cascade and Mono Lake Volcanoes, a survey of volcanic hazards on the U.S. Pacific Coast; and for National Geographic Books, Restless Earth, a study of global earthquakes, tsunamis, and volcanic eruptions. He contributed the chapter on “Archaeology and Volcanism” to the Encyclopedia of Volcanoes (Academic Press, 2000). Gloria Platzner teaches in the English and Humanities programs at California State University, Sacramento, including courses on Classical Mythology and World Mythology.